Some people are just soo successful! It seems as if they always have the very best ideas, are clear about their aspirations and frequently accomplish their goals. Some people just seem to be really winning at the game of business and life! How do they achieve such clarity of purpose? What’s keeps them accountable to themselves and on target? Do you suppose they have a secret? They might! And, it might that they use an Executive Coach! It’s sounds simple, but the results of executive coaching can be astounding. I hired my first coach in 2012 and it changed the course of my professional life. Decisions I made in the process included revising my practice and led to me selling one of my businesses! I’ve since done pretty major rebranding and I’ve never looked back. And, I still use an executive coach, too! Yes, successful people like you desire financial success and personal purpose; you want to make a significant impact in the world and savvy people never go it totally alone – they seek help. Yes, high-achievers, I said help, help from seasoned professionals that communicate at your level, push you to work through roadblocks and challenge you to create and implement big objectives. Sound like what you’re seeking? I’ve logged over 5,000 coaching hours – that’s quite a lot of calls, video meetings, and one-on-one time! Besides experience, I believe in using proven tools and a performance-based approach that you and I agree upon up front or we walk away, no questions asked. 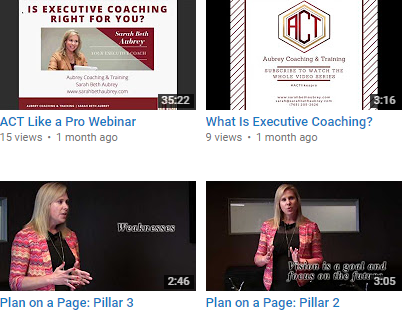 Executive Coaching can take a variety of courses. 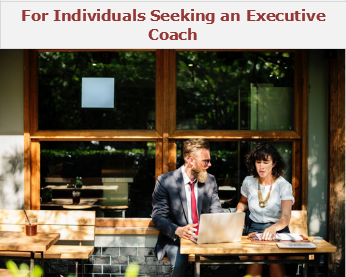 For me, there are two tracks, individual professionals seeking their own executive coach or organizational leaders seeking a coach for an team member or for a group program for several team members. Regardless of the type of client, executive coaching is always highly personalized and confidential. The ACT process of coaching can be found to the right and available for download here. Executive Coaching Readiness QuestionnaireI start the discover process for individual coaching with this questionnaire above. Contact me to discuss corporate pricing for one team member or a small group. This is often combined with other speaking programs and we should talk about how adding executive coaching fits into your overall objectives. Either call (765) 205-2626 or click here to send Sarah message. Like most coaches, I have my specialties, the areas where I believe I am best equipped to support my clients.